As I posted yesterday, I am currently battling it out on the northern front with legions of cold germs waiting to wreak havoc upon my well being. I went to work today, because I had to get some stuff done, but left early when the Battle at Big Nose started to turn in the enemy’s favor. 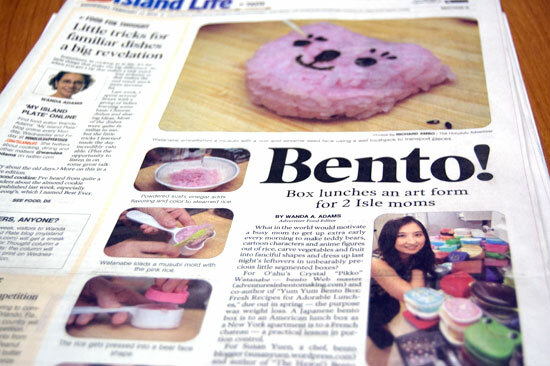 I have a lot of new visitors today, as Wanda Adams’ story on bento ran today in the Honolulu Advertiser. My existing readers, be sure to check it out and let me know what you think! I came in to work with this all in pieces, a tub of rice, nori, my punches, and some deco furi thinking that I could put it together for lunch because how rude of me to not have something cute for people to coo over today of all days. When I got in to work though, my computer started throwing a tantrum the likes of which Baby Girl and Buddy can only aspire to, crashing every five minutes, shutting down programs, and pushing my email through an endless loop of opening and crashing. 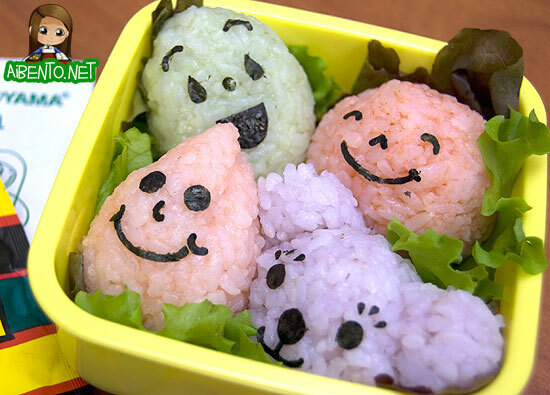 And so, in between reboots, I was able to put this onigiri bento together. It’s just rice, which I ate with tea and a packet of ochazuke sprinkles to help my cold. I did bring some aka ume in a bag to eat too, since the saltiness should help with my sore throat. I used four different colors of deco furi along with a snipped Ziploc bag to form shapes for a purple bear, a red ball, a pink teardrop, and a green leaf. I used the nori punches that Maki sent me recently. For those new to my site, Maki is my co-author for Yum-Yum Bento Box: Fresh Recipes for Adorable Lunches , which comes out this June. 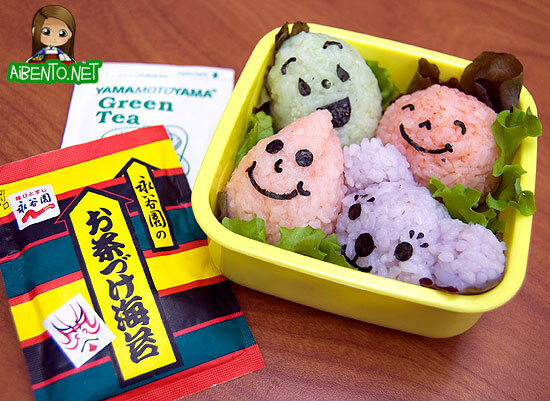 Visit the Yum-Yum Bento site for more details on the book. I brought along a packet of ochazuke and green tea to eat and it was really tasty, especially since deco furi has flavor. You can buy it at Marukai now! Here’s a picture of the paper today! 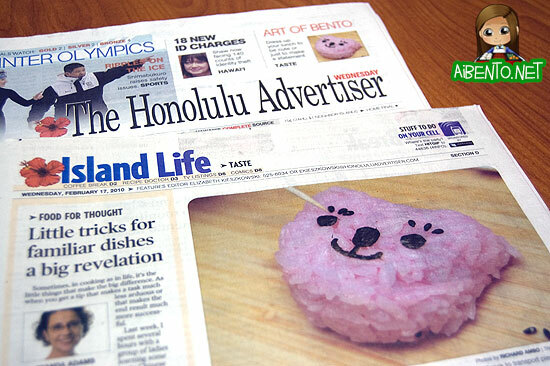 There’s a little blurb on the front page and then a BIG HUGE picture of the musubi on the front of the Island Life section. Big big thanks to Wanda Adams for interviewing me and for exposing the bento psycho in me. Maybe that will make me stop buying bento boxes. Those wanting to get into bento can also check out my online bento newsletter Bento Central, which I just launched last month.